Young Hillary Rodham saw the church’s social concerns shift from alcohol and gambling to sexism and racism. After Bill Clinton, a Bible-toting Southern Baptist, was elected, I repeatedly tried as religion editor of Newsweek to interview him about his religious beliefs and practices. Ten days before the 1994 midterm elections, the White House offered me Hillary, the sturdy Methodist, instead. The first lady spoke candidly about her Methodist upbringing, her core Christian beliefs and prayer habits, and how she frequently consulted the latest Methodist Book of Resolutions, the church’s official handbook on social and political issues, which she kept upstairs in the family quarters. Piety plus politics was her message. I asked her if she ever thought of becoming an ordained Methodist minister once her White House years were over. “I think about it all the time,” she instantly replied. But after exchanging glances with her press secretary, Lisa Caputo, she asked me not to print what she had said because she felt it made her sound much too pious. I didn’t. 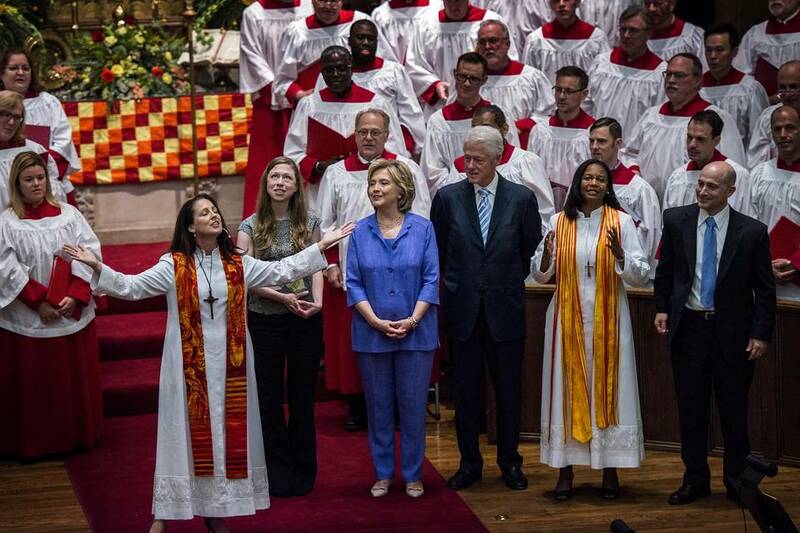 Although religion is not an issue in this year’s presidential election, Hillary Clinton is by far the more religious candidate. What’s more, hers is the more religious political party—even though atheists, agnostics and other religiously nonaffiliated Americans (the “Nones”) now represent the largest bloc, replacing African-Americans, within the Democratic Party. To understand this seeming paradox, we first have to recognize that since its transformation in 1972 under another Methodist politician, George McGovern,the Democratic Party has advanced a righteous politics that mirrors the political righteousness of the United Methodist Church. Their longtime concern with politics is symbolized by the Methodist Building, still the only nongovernmental edifice on Capitol Hill. It was built during Prohibition to house the denomination’s powerful Board of Temperance, Prohibition and Public Morals. The building also provided office space for Washington lobbyists representing the other mainline Protestant denominations. Together, they formed a moral Maginot line against the growing political influence of American Catholics as a threat to their vision of a Protestant America. By the time Hillary Rodham joined a Methodist youth group in the early 1960s, the church’s social concerns had shifted from alcohol, gambling and shopping on the Sabbath to racism, sexism and the war in Vietnam. Thanks in large part to South Dakota’s George McGovern, so would the concerns of the Democratic Party. The events of 1972 inaugurate what I call the Methodist Moment in Democratic Party politics. That was the year McGovern won the party’s presidential nomination—and, coincidentally, the year former Republican Hillary Rodham became a Democratic Party activist. McGovern was the son of a Methodist minister, grew up in a Methodist manse, graduated from a Methodist college, studied for the Methodist ministry before taking a doctorate in history, and taught at his Methodist alma mater before accepting the challenge of rebuilding South Dakota’s moribund party. His stump style was prairie preacher; his reformer’s rhetoric Methodist to the core. In 1972 the United Methodist Church, as it was by then called, held its quadrennial General Convention—the church’s highest legislative body—as it does every presidential election year a few months prior to the national political conventions. A review of the positions taken by the church reveals remarkable congruence with the Democrats’ subsequent party platform. Both opposed the war in Vietnam and called for immediate withdrawal of U.S. troops. Both framed the nation’s economic ills as “systemic” and proposed wholesale transformation of political, economic and social institutions. To counter overpopulation, the convention recommended the distribution of “reliable contraceptive information and devices.” Less than a year before Roe v. Wade, the convention urged “removal of abortion from the criminal code” but stopped short of approving abortion on demand. Finally, the Methodists embraced affirmative inclusion by reserving 30% of seats on all church boards and agencies for nonwhites, even though barely 6% of church members were African-American. The events of 1972 also hastened the steady decline in membership and influence among the liberal mainline churches. Before the 1970s were out, the politically and socially conservative Southern Baptists superseded the United Methodists as the nation’s largest Protestant denomination. As one generation gave way to the next, more and more young Methodists, Presbyterians and the like grew up to become religiously something else or—especially among millennials—nothing at all. In sum, many of today’s Nones have retained the Methodists’ ethos of righteous politics while jettisoning the beliefs, behavior and belonging that made righteous Methodists Methodists in the first place. Many Jews and Roman Catholics can and do find in progressive Democratic politics aspects of their own social-justice traditions. But the emergence of the Nones shows us that anyone can think and act like righteous Methodists just by being a liberal Democrat. Mr. Woodward is the author of “Getting Religion: Faith, Culture and Politics from the Age of Eisenhower to the Era of Obama,” just published by Convergent Books.